Legendary sitarist Ravi Shankar, renowned Brazilian guitarist and songwriter Caetano Veloso, South African trumpeter Hugh Masekela, Senegalese superstar Youssou N'Dour, and National Public Radio's Peabody Award-winning correspondent Scott Simon are just some of the highlights of the 2007-08 UC Santa Cruz Arts & Lectures season. The new season kicks off on Sunday, October 7, with Daniel Beaty's "Emergence-See," a provocative one-man show of slam poetry, theater and song, in which Beaty portrays a cast of 40 characters who offer a stirring commentary on modern black life. This solo tour-de-force was honored in May with a 2007 Village Voice Obie Award for Outstanding Writing and Performance. 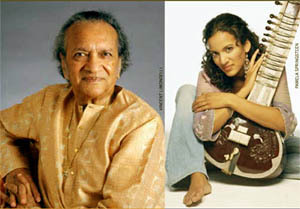 Ravi Shankar graces the stage of the Santa Cruz Civic Auditorium on November 4, with the esteemed musician, composer and performer accompanied by an ensemble of world-class musicians led by his daughter, Anoushka Shankar. And on November 16, Caetano Veloso will bring to Santa Cruz his innovative mix of Brazilian pop, rock, bossa nova and tango fusion for a show that will be presented with Kuumbwa Jazz Center. Described by Rolling Stone as "the most influential Brazilian artist of his generation," Veloso has toured and collaborated with such luminaries as Gilberto Gil, Gal Costa, and Maria Bethania. African pop star Youssou N'Dour takes over the Rio Theatre on November 28 with his infectious blend of African and Caribbean rhythms. Hailed as "the best known African musician in the world" by the BBC, N'Dour has collaborated with Peter Gabriel, Sting, Paul Simon and Wyclef Jean, and received a Grammy for Best Contemporary World Music Album for his 2004 release, Egypt. This show will be presented in conjunction with Pulse Productions. The lineup also features 27-year-old Grammy award-winning violinist Hilary Hahn in concert at the UCSC Recital Hall on October 17. Hahn can be heard as featured soloist on the Oscar-nominated soundtrack to M. Night Shyamalan's feature film, The Village. Other classical concerts include the critically acclaimed Borromeo String Quartet on February 24; and The Romeros--described by the New York Times as "the only classical guitar quartet of real stature in the world today"--on April 11. On the dance front, UCSC Arts & Lectures will present an evening with Ailey II--the brilliant company founded by legendary choreographer Alvin Ailey--on February 11. Ailey II merges the energy of the country's best young dance talent with the creative vision of today's most innovative emerging choreographers. Hawaii's Kahekili Dance Company will also present a hula drama featuring traditional dance, music and storytelling from Maui on February 23; and Ballet Folklorico Quetzalli de Veracruz offers a visual fiesta featuring the dazzling costumes and irresistible rhythms of old Mexico on April 25. Other highlights of the season include a collaboration between the haunting vocal quartet Anonymous 4 and virtuoso instrumentalists Darol Anger (violin) and Scott Nygaard (guitar) at the UCSC Recital Hall on January 25; Music From the Crooked Road, a national tour of old-time, bluegrass, mountain and Gospel music that will be presented with Snazzy Productions on October 25; a one-man show by Emmy Award-winning actor Joe Spano exploring the life of R. Buckminster Fuller on March 14; and Sierra Leone's Refugee All Stars on February 19. Hugh Masekela and the Chissa All-Stars perform on February 5; and best-selling author and host of NPR's Weekend Edition Saturday, Scott Simon, will speak on April 21. UC Santa Cruz Arts & Lectures is the largest interdisciplinary presenting organization in the Monterey Bay region. For more information about the new season or to obtain a full-color brochure, contact the UCSC Ticket Office at (831) 459-2159 or e-mail: tickets@ucsc.edu.